The Trends in International Mathematics and Science Study (TIMSS) and the Progress in International Reading Literacy Study (PIRLS) are international studies directed by the IEA (International Association for the Evaluation of Educational Achievement), an independent international cooperative of national research institutions and government agencies that has been conducting studies of crossnational achievement in a wide range of subjects since 1959. In Australia, TIMSS and PIRLS are implemented by the Australian Council for Educational Research (ACER), which is Australia’s representative to the IEA. In Australia, TIMSS is part of the National Assessment Program. TIMSS has been conducted at Year 4 and Year 8 on a four-year cycle since 1995 and PIRLS at Year 4 on a five-year cycle since 2001. In 2011, the cycles for TIMSS and PIRLS coincided for the first time and participating countries were offered an unprecedented opportunity to conduct both TIMSS and PIRLS with their Year 4 students. Australia was one of a group of countries that chose to have the same sample of Year 4 students participate in TIMSS and PIRLS, thus obtaining results for students in reading, mathematics and science. 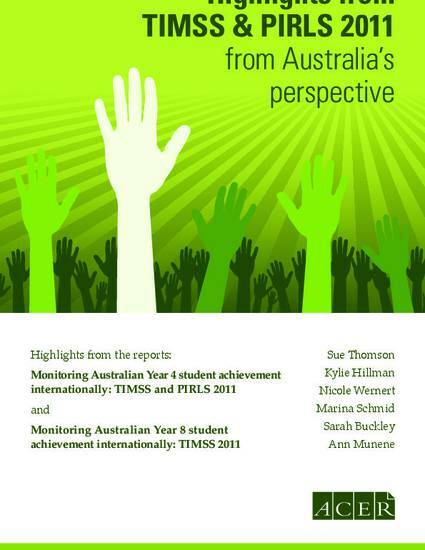 As in previous cycles, Australia also participated in TIMSS at Year 8. Australia has participated in TIMSS since its inception, providing rich data about trends in mathematics and science achievement over 16 years. This is the first time that Australia has participated in PIRLS, or indeed any international study of reading achievement at this level.